I like these veggie burgers best when they’re topped with roasted peppers and fresh greens, but the kids liked them dressed like traditional burgers. Either way, this is a wholesome and tasty take on burger night. Toss the eggplant with 3 tablespoons of the olive oil and spread out on a baking sheet. Toss the mushrooms with the remaining tablespoon of oil and spread on a separate tray. Roast the eggplant and mushrooms at 400 degrees for 30 minutes, until golden brown and softened. Cool to room temperature. Place the mushrooms and 1 cup of the eggplant in a large bowl and puree with a hand blender. Add the remaining eggplant to the pureed mixture and stir well. Add the cheese, carrots, scallions, garlic, and seasonings to the vegetable mixture. Mix thoroughly. Stir in the softened butter and breadcrumbs. Mix until everything is well incorporated and the mixture holds together when gently squeezed. Shape into patties — you should get 6-8 patties from this recipe. Lightly coat a skillet or griddle with olive oil. 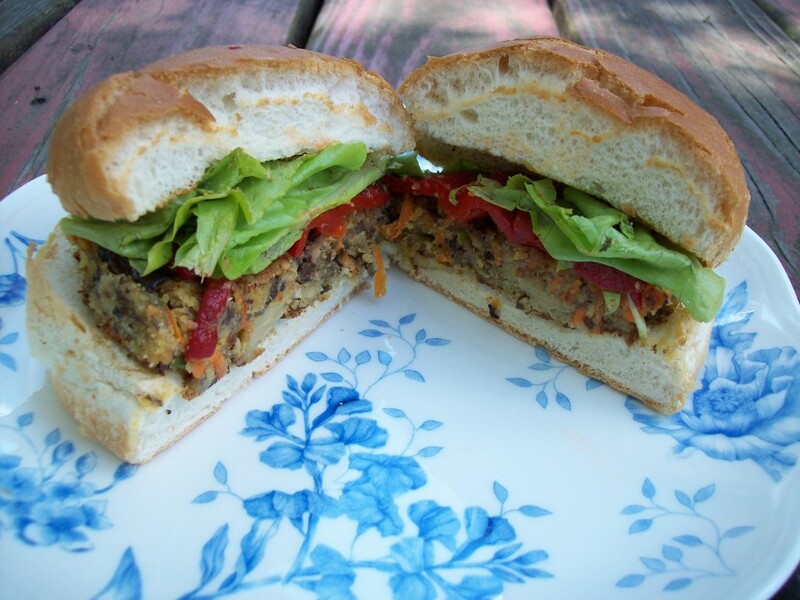 Cook the veggie burgers over medium-high heat for 3-4 minutes per side, until golden brown and slightly crusted. Serve immediately on a bun of your choice.